In a surprise announcement, the head of NPR has declared that he will be leaving the network to lead the National Geographic Society, which not only publishes that famous yellow-bordered magazine but also operates a cable channel and is planning to build some educational theme parks--returning him to his pre-NPR roots as longtime head of the company that produces Sesame Street. Why is he leaving NPR after only 21 months? He didn't give a reason, other than the lure of National Geographic, which must be far less depressing to run than an organization with a million-dollar deficit and chronically politicized Congressional funding. On the other hand, every morning now he'll have to face himself in the mirror before going off to run the company that produces Doomsday Preppers. At 9 a.m. every weekday this week and into the next, we're surveying the great, full-length, Romantic-era ballet scores. Several qualifiers there, and toward the end we'll be getting into material that strictly speaking is not from the Romantic era but does carry on its traditions. We'll start today (Aug. 19) with the score that started it all, Adolphe Adam's Giselle. True, Beethoven had written an hour-long ballet score and there was certainly no shortage of dance music for the stage during the next few decades, but it was Giselle in 1841 that solidified the idea that good music--not the insipid material that was often foisted upon dancers--could sustain an evening-length story in dance. From Giselle we'll move on to the complete scores of Delibes' Coppélia on Tuesday and Sylvia (a rarity on stage now, but sometimes heard in concert suites) on Wednesday. Then comes the greatest ballet composer of the 19th century, Tchaikovsky. His Swan Lake will dominate Thursday morning, with Sleeping Beauty following on Friday. We'll take the weekend off from ballet music, then return next Monday morning at 9 with Tchaikovsky's The Nutcracker something that really should not be limited to Christmastime performances. Then next Tuesday we'll venture into the 20th century with two lush, Romantic-style ballet scores by a composer who started out as a noisy iconoclast: Sergei Prokofiev. His Romeo and Juliet, surely the full-length ballet score of the greatest musical substance, will be featured in its entirety on Tuesday, and we'll conclude the series with extended excerpts from his Cinderella the following day. And after that, you'll just have to sit still while you listen to Classical 90.5. Radio ratings were just released and once again NPR 89.1 maintained its top rank among other news/talk radio stations in the Tucson market. Morning Edition on NPR 89.1 ranked #3 in the market for listeners age 12+(1) and #1 for listeners 50+(2). Classical 90.5 ratings also increased by 15% from the winter 2013 survey(3) and weekly cumulative audience was up 4% over last year(4). Several staff promotions were announced in recent weeks. Enrique Aldana has been promoted to Director of Development. Aldana was formerly Associate Director of Development. With the recent retirement of Fran Sherlock, AZPM’s longtime Director of Production and Broadcast Operations, three internal promotions were made. Ian Hubbell has been promoted to Post-Production Manager, Martin Rubio to TV Production Manager, and Greg Steed to TV Master Control Supervisor/IT Engineer. Editor, Mitch Riley was also promoted to Producer/Editor and Lili Bell, formerly TV Traffic Manager, has been promoted to Broadcast Schedule Manager. Finally, in the business office, Gus Loaiza has moved up to Accounting Specialist. Alan Fischer, Public Information Officer for the Planetary Science Institute, joined the AZ Illustrated team as the co-host of Tuesday’s AZ Illustrated Science edition. Fischer is a journalist who has specialized in science and technology reporting and has a strong interest in writing about space exploration. Fischer is a graduate of the University of Arizona with a degree in journalism. Laura Palmisano joins the AZPM news team as a Reporter/Producer. Palmisano holds a journalism degree with a minor in sustainability and has worked in public broadcasting and for the Cronkite News Service. Maria Taracena, a recent graduate of the UA School of Journalism and freelance writer, was hired as an Online Reporter/Editor. With these promotions and new appointments, AZPM continues to demonstrate the investment in our staff as well as our continued mission to create, acquire, and distribute high-quality, relevant content for and about Arizona, the University of Arizona, and the Southwest. For more information on employment opportunities with AZPM, please visit https://about.azpm.org/jobs/ or the UA Job Siite. This month brings the first PBS 6 membership campaign of the new fiscal year. Themed “Cool Summer Nights,” these programs will definitely cool you off from the summer monsoon heat and humidity. Music specials highlight the campaign and include, “60’s Girl Grooves,” with host Mary Wilson of the Supremes, “The Jimmy Dean Show: Country Classics,” hosted by Roy Clark, “Elvis, Aloha from Hawaii,” and “Alfie Boe: Storyteller at the Royal Albert Hall,” just to name a few. Check PBS 6 program schedules for dates and times. I hope you will keep in mind that your financial support of AZPM is critical in helping to provide you with the award-winning, wide variety of engaging and educational programming that you have grown to expect. Thank you for your viewership, listenership, and continued support. (1)Metro Average Quarter Hour share, age 12+, Spring 2012 – 2013, ©Arbitron, Inc., ©Radio Research Consortium, Inc.
(2)Metro Average Quarter Hour share, age 50+, Spring 2012 – 2013, ©Arbitron, Inc., ©Radio Research Consortium, Inc.
(3)Metro Average Quarter Hour share, age 12+, 50+, Winter 2013 – Spring 2013, © Arbitron, Inc, ©Radio Research Consortium, Inc.
(4)Metro Cume Persons, 12+, Spring 2012, Spring 2013, © Arbitron, Inc, ©Radio Research Consortium, Inc.
We kick off July with one of our biggest programs of the year, “A Capitol Fourth.” This live PBS broadcast of America’s favorite Independence Day tradition features unrivaled performances from some of the country’s best-known performers, topped off by the greatest display of fireworks anywhere in the nation. Tom Bergeron (Dancing with the Stars) hosts this all-star lineup live from Washington, D.C. on Thursday, July 4th from 5 to 6:30 p.m., with an encore performance at 7:30 p.m. The PBS 6 patriotic celebration continues at 6:30 p.m. with Ken Burns’ documentary “Statue of Liberty,” followed later that evening by the premiere of “Magic Skies: A History of Fireworks” at 9 p.m. 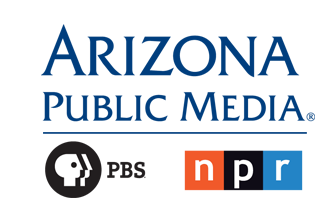 This month there are some program scheduling changes to NPR 89.1 and to PBS 6. On NPR 89.1, the daily news-magazine radio program Here & Now debuts Monday, July 1st from 11 a.m. to 1 p.m., replacing Talk of the Nation, which concluded production on June 27th. Tune in and welcome hosts Robin Young and Jeremy Hobson for breaking news and in-depth analysis. To learn more about the program, visit azpm.org. -POV will move to one hour earlier on Monday nights, to 10 p.m. from 11 p.m.
-MI-5 switches to five nights a week, Monday through Friday, from 11p.m. to 12 a.m.
-DCI Banks, a new BBC detective drama series based on crime writer Peter Robinson’s novels, takes Doc Martin’s place on Thursdays at 9 p.m., starting July 11th. -Doc Martin Season 1 encore broadcasts move to Sundays at 9:30 p.m. beginning June 16th. -Charlie Rose: The Week premiers July 19th and will air on Fridays at 10 p.m. The 30-minute program joins the PBS 6 public affairs lineup to revisit some of the best reports and interviews of the week, while looking ahead to developing business, political, arts and cultural stories. Visit PBS 6 and *NPR 89.1 for updated program schedules. July is the start of a new fiscal year for AZPM, and I thank you for your financial support during our 2013 fiscal year-end fundraising campaign. It takes everyone who uses, appreciates and values public broadcasting to support it. Your pledge to AZPM not only provides you with the wide and award-winning variety of programming that you have grown to expect, but your support also allows AZPM to employ the talented journalists, producers and videographers who create and deliver the stories about our unique community that we all value so much. Here's a photo gallery of beautiful interiors of opera houses around the world. Note that most of them are older buildings, before the minimalist aesthetic took over in the 1960s (and ruined opera-house and concert-hall acoustics; the shape of the room and ornamentation on the walls have as much to do with the sound of a place as its look). There are may recent opera buildings with stunning exteriors, but you don't get interiors like these anymore. The month of June brings us to the end of another fiscal year and our year-end membership countdown. Viewer and listener support is critical to meeting our financial obligations and to starting next year on a solid footing. Your support helps fund your favorite national programs plus the original radio, TV and online programs that are produced here at AZPM, such as AZ Illustrated, Arizona Week, and Arizona Spotlight. To thank those of you who have stepped forward to help defray programming costs, we have assembled some great shows this month on PBS 6. Matthew Morrison (Mr. Schu from the hit television show Glee) takes the stage in his first PBS special, “Matthew Morrison: Where it All Began.” Other highlights include, “70’s and 80’s Soul Rewind,” “Il Volo: We Are Love,” and Ken Burns’ “Central Park Five.” Also this month, Masterpiece Mystery! “Inspector Lewis, Series VI” premieres Sunday, June 16th at 8 p.m. on PBS 6. Kevin Whately returns for a sixth season as Inspector Lewis and continues to solve cases in the seemingly perfect academic haven of Oxford with his young partner DS Hathaway (Laurence Fox.) For complete program schedules, visit here. Audiences trust Arizona Public Media to provide entertaining and engaging programs, and we continually research new shows that will resonate with the Southern Arizona community. With that in mind, three nationally syndicated radio programs will begin broadcasting weekends starting June 1st on NPR 89.1: The Splendid Table, Marketplace Money and the TED Radio Hour. • The Splendid Table with host Lynne Rossetto Kasper, explores everything about food: the culture, the science, the history and the deeper meanings that come together when people sit down to enjoy a meal. The Splendid Table joins the Saturday afternoon line-up at 1 p.m.
• Marketplace Money, produced by the award-winning team of Marketplace and Marketplace Morning Report, brings the week’s economic headlines home by looking at matters of personal finance with wit and wisdom. The program, which airs Saturdays at 3 p.m., offers a mix of interviews with experts and calls from listeners to help people better manage, save and spend their money. • TED Radio Hour, is a journey through fascinating ideas, astonishing inventions and new ways to think and create. Each episode includes riveting excerpts from the renowned TED stage where some of the world's deepest thinkers and innovators are invited to give the 18-minute "talk of their lives." Host Guy Raz interviews the guests, delving deeper, dissecting the speaker's ideas and posing probing questions that you would like to hear answered. Ted Radio Hour will be broadcast at noon on Sundays. For more information about these three new shows, visit azpm.org. The addition of these shows will lead to some changes to the weekend afternoons schedule on NPR 89.1. Tech Nation will not air Sundays, but will continue to air at 5 a.m. on Saturday mornings. Snap Judgment and Living on Earth will no longer be broadcast. For complete NPR 89.1 program schedules, visit radio.azpm.org/schedules. Rick Bayless, the featured chef on ReadyTV this month, celebrates the ninth season of his highly-rated cooking and travel show, Mexico - One Plate at a Time. Rick takes viewers on a culinary and cultural exploration of the state of Oaxaca. Watch the new season on Sundays starting at 2 p.m. on Broadcast 6-3, Comcast 201, and Cox 81. Rumor has it that Rick will visit Tucson in March 2014 as a guest chef in the Culinary Tent at the fifth annual Festival of Books on March 15th and 16th. Our efforts for the benefit of Southern Arizona would not be possible without you. Please accept my sincere thanks for your continued support and best wishes for the summer.